There’s a lot of focus these days swirling around us encouraging us to discover our vision. Who we want to be, what we want to stand for, what we want to make and leave for the world, and the impression we want to leave behind. But what happens if you don’t have one? Don’t freak out. Deep breaths. If you’re not a visionary per se, then it turns out – according to author, leadership guru, and all around humble and wonderful human, Simon Sinek – you’re a lot like the rest of us. It’s no secret that I’m a Podcast junkie (check out my confession). I listen to a wide variety of topics from outdoor adventures for women and their dogs (yeah, that one’s a niche) to entrepreneurship and marketing over coffee. This idea of “having a vision” creeps into many of the Podcasts I listen to as well as mainstream media. Simon Sinek was a guest on one of my regular Podcasts recently and had some insightful comments which I hope will lay a foundation for the idea of having vs. finding a vision. If everyone were a visionary, nothing would get done. Visionaries exist to think big things. Their teams exist to make those big things happen. But what most likely will NOT happen is that you “stumble upon” or have your vision “dropped into your lap”. Go look for it. Try on some different visions. Steve Jobs or Bill Gates? Find the one that fits best. Don’t simply accept one you feel lukewarm about. The problem most visionaries – and subsequently, their organizations – run into is the inability to clearly communicate their entire vision. Imagine how Sam Walton would feel about the downturn of Wal-Mart after his death in 1992. Visionaries will light the torch. But it’s up to their teams to carry the torch when they are gone. 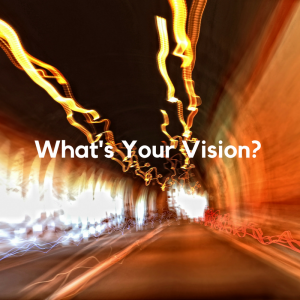 Help your visionary clearly outline what they want for the organization as well as what they DON’T want. Organizations that only last a few generations fail because the new leaders don’t understand the original vision that made it so great in the first place. You’ve found your visionary, you have your vision. Now you need a team to make all those big things happen. Thus begins the hiring process. The way many businesses tend to hire is according to a blind list of skills and assets. We look at resumes, have a few superficial interviews, and boom. Hired. And it’s ok if we hire that way because we can always fire them if it doesn’t work out in a few weeks or months. Right? Whatever the vision you find (or even if you do happen to have your own vision), pursue it doggedly. It is an ever-evolving craft that, with any luck, will keep you moving forward (hats off, Mr. Disney) for many generations.